Cory Walters just posted an article about how good prices look right now for corn. In addition, the corn crop looks great from the road. But before you decide to contract that rest of your expected yields, get into the fields and make sure pollination went well. 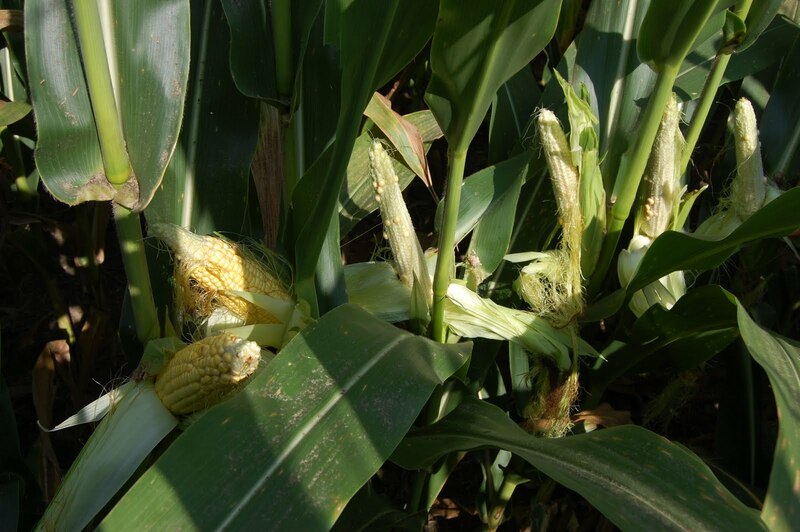 We have received several reports from county agents of fields with poor pollination. Perhaps the most unsettling report came from Tom Miller, Extension agent in Ballard County, who said that pockets of a field had poor pollination. Plants in the same row had good pollination while others had terrible pollination. (One of his images is attached to this article.) At this point, hot dry weather and slight variations as to when pollen drop occurred appears to be the best explanation. This is unsettling, because the whole field looks excellent from the road. So, if the silks are dry, then pull back the husks and look at the developing "blisters" or seeds. You know how a good ear of corn should look... even number of rows, pollination from the base to the tip of the ear. If the silks are still wet, but pollen drop appears to be complete, then you can gently remove the husks and get an estimate of pollination. To do this, make a cut through the husks with a sharp pocket knife along the ear. Start at the base of the ear and slice up to the tip. Make a second slice on the other side of the ear. If you have done a good job making the slices, you should be able to gently pull off the husks without removing the silks. If silks come off with the husks, then get a new ear and start over. Once you have successfully removed the husks and kept the silks on the ear, hold the ear at the base and gently shake it. You may want to point the top of the ear towards the ground. As you gently shake, silks will fall from the ear if pollination has occurred. Again, you are hoping for all of the silks to fall from the ear. Pollination normally occurs from the base of the ear and then moves toward the top. 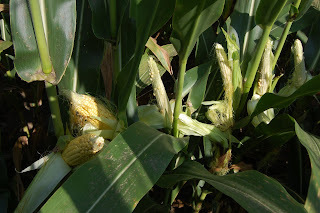 If you happen to get an ear where the silks near the base fall off, but the silks near the top do not, then pollination may not be complete in the field. Grain Market Update, July 18, 2010. Since the first week of July Corn, Soybeans, and wheat futures prices have all significantly increased. December 2010 corn futures reached contract lows before rebounding $0.62 (or 18%) to close around $4.07 on Friday, July 16, 2010. Corn futures have not been this high since the beginning of March. November 2010 soybean futures gained about $0.85 (or 9.4%) to close around $9.85 on Friday, July 16, 2010. It was the end of April when soybean futures last closed at these levels. September 2010 CMEGroup wheat futures have gained about $1.07 (or 22.3%) to close around $5.87 on Friday, July 16, 2010. Seven months have passed since wheat futures last reached current levels. For corn, the USDA crop progress report for the week ending July 12, 2010 indicates that 73% of the nation’s crop is rated good to excellent. This is up slightly from the previous week and about the same this time last year. For Kentucky, the USDA crop progress report indicates that 65% is rated good to excellent. For soybeans, the USDA crop progress report for the week ending July 12, 2010 indicates that 65% of the nation’s crop is rated good to excellent. This is down slightly from the previous week and about the same as this time last year. For Kentucky, the USDA crop progress report indicates that 68% is rated good to excellent. Even though we are in the middle of the growing season, and yields to this point are uncertain, price changes are not all supply driven. Since the end of the first week in June, the nominal U.S. broad dollar index, which measures the value of the U.S. dollar relative to major trading partners, has fallen over 3%. Commodity index funds for both corn and soybeans have been in a sideways position for the past few months. For corn, speculators are net long, meaning there are more longs or purchases than shorts or sales of futures contracts, indicating a slight sense of bullishness. For soybeans, speculators are net short, indicating some bearishness. Much of Kentucky has turned hot and dry at the worst possible time for corn. About half of the corn crop was silking or complete with silking as of July 5, 2010, according to the USDA Crop and Weather Report. Corn is most sensitive to stress around silking and blister development. In addition, corn uses the most water at silking, as much as 0.35 inches per day. Pollen shed and pollination is improved when temperatures are mild. The majority of pollen is shed in the morning after the dew has dried. A second release of pollen may occur in the late afternoon or early evening as temperatures cool again. The hot, dry weather we are currently experiencing does not favor good pollination. The hot weather will tend to dry out both the pollen and the silks. Temperatures above 100 F can kill pollen. The good news is that most corn fields will pollinate for about 14 days and most pollen shed occurs when temperatures are a little cooler. So, even when conditions are hot and dry, the corn plant will attempt to work around those poor conditions. The bad news is that high temperatures seem to quicken pollen shed. Taking the good with the bad: each field still has a chance for successful pollination. For corn that was through pollination before things turned dry, abortion of kernels is a possibility. The corn plant will recognize that water reserves are low and abort kernels near the tip of the ear, first. Very high plant populations can increase the water stress and increase kernel abortion. What can you do about it? Unless you have irrigation, not much can be done on the agronomics. If you are marketing the current crop on the futures, you might want to be more cautious with your yield targets. Of course, a good rain in the next couple days will solve most of our problems. Kentucky Weekly Crop and Weather Update. July 5, 2010.